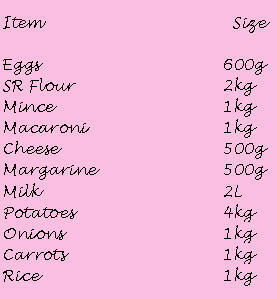 If money is tight and your cupboards and fridge are bare this shopping list will get you through the week. It is a very basic list and not meant for long-term use, but for a week, to save money and use up the food you have it works. Depending on where you shop, this list will cost you between $20 - $30 dollars and will provide 3 meals a day for 4 people every day for a week. Login and download Bare Bones Groceries for recipes and ideas to feed your family for $20 a week.